Shimla is one of the most visited hill stations in India. Owing to its spectacular beauty, architectural marvel and pleasant climate, it has been designated with the title "Queen of the Hills". Words like open roads, thick flora, hip city life, warm and simple people, are all synonymous with the city of Shimla. The true essence of the place lies in its natural surroundings, dotted with British hallmarks. It has so much to offer that visitors are amazed at its diversity. There are a number of places to see in Simla, which will not only prove as good entertainers, but also provide information about the colonial era. Some of the major tourist attractions and places of interest in Shimla are given below. You can catch the pulse of the city at the Mall, as it is deemed to be the heart of Shimla. Once resounded by the foot tapping of British horses, it is thronged by newly wed couples and young hearts. It is the major shopping area in the city and is laced with several shops and restaurants. The Gaiety theatre nearby, is the center of all cultural activities, while the Ridge is the open space in the center of the city. Though there is nothing special about the Ridge, it is forever seen bustling with domestic and foreign tourists. 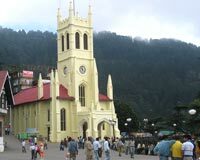 The yellow Christ Church is the most prominent building in Shimla. It is reputed to be the second oldest church in northern India and was consecrated after 1857. It even has a clock, donated by Colonel Dumbleton in 1860, which adds to its majesty. It is still known for its stained glass windows, which attract many people. Himachal State Museum is a great place to visit for all those, who are interested in knowing the historical past of the country. The museum is a colonial structure surrounded by sprawling lawns. It houses valuable collection of coins, photographs and local handicrafts. Other worth seeing items here are doll gallery with a collection of Himachali bride and tribal dolls, along with the collection of Pahari miniature paintings. Jakhu hill is situated at a distance of 2.5 km from Shimla and provides the best view of the city from an elevation. The scintillating sight of the sun rise from here is simply awe-inspiring. It even has a shrine called Jakhu Temple, which is dedicated to Lord Hanuman. The picturesque surroundings of the place are quite relaxing, providing ample opportunity to unwind in the lap of Mother Nature. Situated at a distance of 2 km from the State Museum, the Viceroy Lodge is a majestic grey colored building, dotted by pine trees. It was constructed in 1888 as the residential accommodation of Viceroy Lord Dufferin. It is now known as Rashtrapati Niwas and houses Indian Institute of Advanced studies. This grand Scottish edifice was designed by Henry Irvine. The Lodge offers structures like spiral staircases, huge fireplaces, teak paneled gallery, state drawing room, ballroom, wood paneled dining room, decorated with coats of arms of former Governor-Generals and Viceroys, sprawling verandas and terraces etc.